Starch paste gives stickiness to pigment and increases the adhesion to the aqueous pigment by mixing to the pigment on the plate surface. Also it serves to slow the drying of the pigment. Put starch paste on the container, mix while water was added. Well mixed, make like a potage soup. But do not eat! Washi-paper is must be moistened before printing. 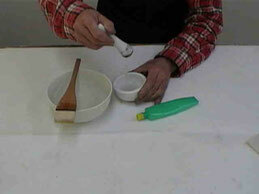 In the dry hard washi-paper, effect of the Baren is Insufficient, the pigment also can not be fully absorbed. First, prepare two cardboards and give the water to one side of each cardboard. Basically,Do not give water to both sides of cardboard. 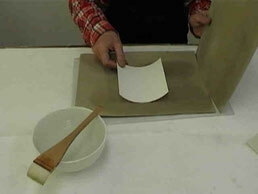 Washi-paper is sandwiched between the surfaces that do not give water directly of cardboard. The moistened washi-paper ready in 30 minutes to 40 minutes. Moisted the washi-paper also increases the thickness, size is also changed to subtle. So, washi-paper must be kept a certain moist condition. Because "kento" does not match. In other words, because the picture is printed displaced.